Network devices that support SNMP, such as switches, routers, servers, printers, or AP's can send alarms (or SNMP traps) when certain events occur, such as interface failure, CPU or network load is too high, a UPS changes status or a disk partition gets filled up. Each device has its own "collection" of possible events, which is reflected in a collection, called MIB, in this case, different from the MIB we used to query the device. Traps are usually received in RAW format. Regarding numerical OIDs, that means unless an MIB is installed on the Operating System which is capable of resolving them, the Pandora FMS Enterprise SNMP Console enables rule creation for renaming numeric OIDs to alphanumeric ones or simple descriptive text strings (e.g. 'interface is down') in order to make working with TRAPs more intuitive. Pandora FMS allows loading trap MIBs of any sort in order to automatically define such rules. As for this configuration, traps will be created for the "public" community and won't need any authorization. The engineID must be specified with the -e option. Otherwise, only SNMPv3 INFORMs will be received. 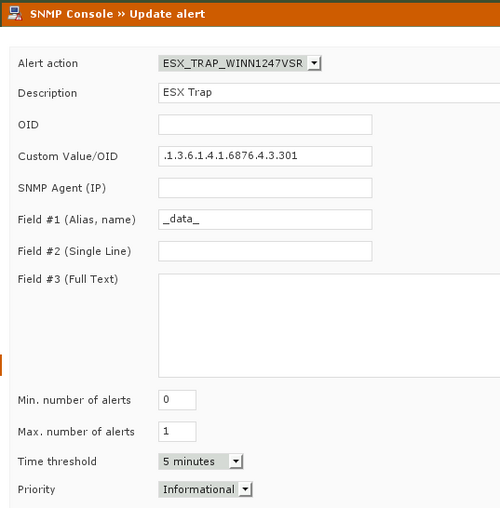 To use the trap reception console, please go to Monitoring > SNMP > SNMP Console, where you may take a look at the list of TRAPs which have been received so far. There is an eye-shaped icon which displays all the trap information. 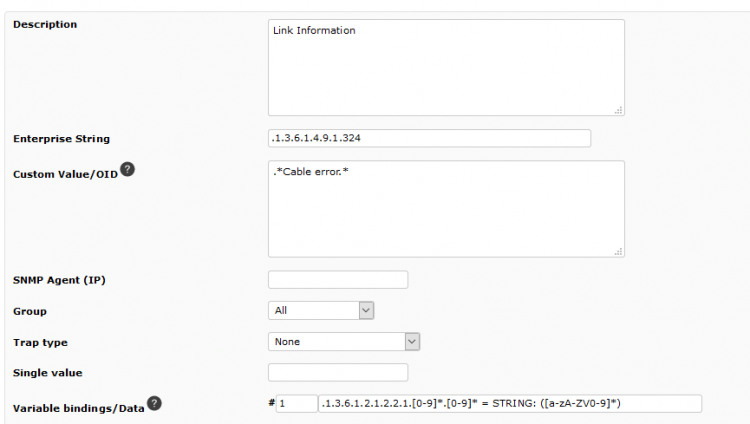 You're able to learn all detailed information regarding SNMP traps here. A green box appears if the trap is validated. It turns red if not. The Agent which has sent the trap. The OID of the sent trap. A trap can only send one piece of data in this field. The value field of the sent trap. A trap can only send one piece of data in this field. The customized fields, sent within the trap. They sometimes consist of very complex data which bears a specific logic, which sends the trap. A trap is able to send several types of data in this field. The elapsed time since the trap reception. A yellow box appears if any alert was launched by this trap. It's gray if no alert was launched. The field for deleting or validating the trap. In the upper part of the trap console, the option named 'Toggle Filter' is displayed. By clicking on that option, the trap's filtering field options appear or disappear. In order to effectively manage the traps it's possible to validate them, so the Administrator is able to distinguish between pending traps and the ones already seen. To validate a trap, click on the green circle to the left of the trap. It is also possible to validate multiple traps by marking them and clicking on the "validate" button. The procedure is similar to how events work in Pandora FMS. It is possible to delete traps once they have been edited, either individually or by multiple selection and the "Delete"action. To prevent traps from accumulating, there is a default setting option that automatically deletes traps older than 10 days. Description: A combo box for an alert description. Enterprise String: The main OID of the trap. It will look for the presence of the string. For example, if you're looking for a piece of the OID, we can use 1.21.34.2.3 and every OID that contains that one will be filtered, in a similar way of *1.21.34.2.3. * But there is NO need to use the * character. Custom Value / OID: This element is going to search within the trap's 'value', 'custom OID', 'custom value' and in the rest of the TRAP fields. Regular expressions are supported here. For example, if we have a trap that sends the "Testing TRAP 225" string, we can search for any trap with the subchain "Testing TRAP" with the regular expression "Testing. *TRAP. *"
SNMP Agent: The agent's IP which has sent the trap. You're able to use a regular expression or a substring here, too. Trap type: The filter by trap type. Accepted values are 'cold start', 'warm start', 'link down', 'link up', 'authentication failure' or 'other'. Most of the generated traps are usually "Other" type; if we don't specify anything, it will look for any type of trap. Single value: It filters by trap value. In this example, it's .666. Please keep in mind this refers only to the MAIN OID value, not to any additional OIDs within the custom data section. Variable bindings/Data #1-20: These are regular expressions which try to match the binding variables from '1' to '20'. If there is a match, the alert is fired. 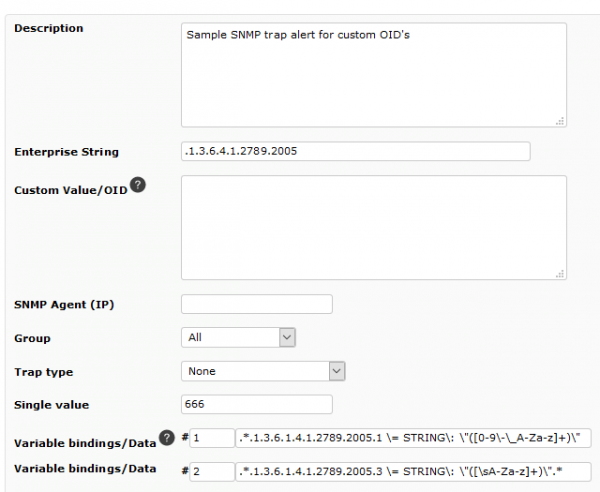 The value of the variable is stored in the corresponding '_snmp_fx_' macro (e.g. _snmp_f1_, _snmp_f2_, etc.). Although only twenty binding variables are able to search for matches, the _snmp_fx_ macros are set for all of them (_snmp_f11_, _snmp_f12_, etc.). Field 2: Field to set the command parameter of the Field 2 alarm. In the case of sending an email, e. g. will be the subject of the message. If left blank, it would use what it had defined in the action. Field 3: Field to set the command parameter of the Field 3 alarm. In the case of sending an email, it would be the text of the message. If left blank, it would use what it had defined in the action. Min. Number of Alerts: The field to define the min. amount of traps which have to be received to trigger the alarm. Max. Number of Alerts: Field where the maximum number of times the action will be executed in the given interval (or time threshold). Time Threshold: The field for determining the time to elapse before resetting the alarm counter. This counter is the one which is getting used for the field named 'min. number of alerts'. Priority: Combo where the alarm priority is set. The priorities of the alerts are different and have nothing to do with the priority of the traps, nor with the Pandora FMS events. 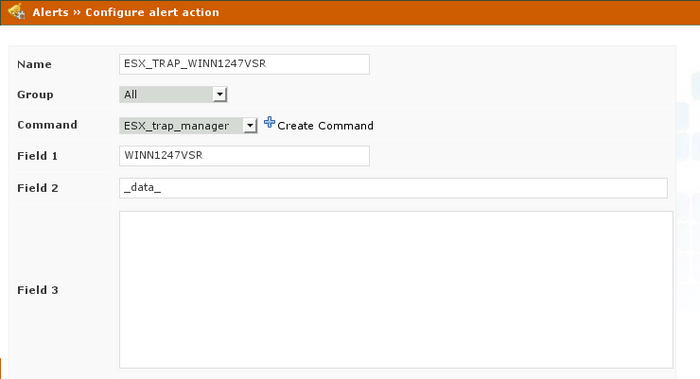 Alert Action: The combo box for selecting the action which is going to execute the alert. 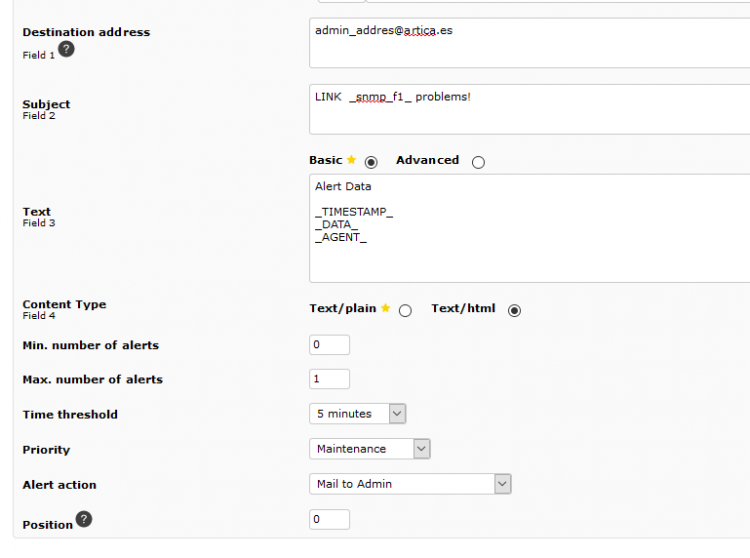 If you select an event, the normal event of an alert creation is not going to be created. Position: The alerts with a lower position are evaluated first. If several alerts match with a trap, all matched alerts with the same position will be triggered. Although lower position alerts match with the trap, they will not be triggered. In this case, we have a main OID (. 1.3.6.1.4.1.2789.2005) that identifies a trap that can contain CPU overheating messages (we don't know if about anything else) but we know that in two variables it shows that the CPU heats up and the temperature of that CPU at that time, in variables 1 and 2 respectively. As we want to identify only the CPU heating traps, we match the Heat alert string in the first variable of the trap (remember that we have up to 20 for searching). The second part of the trap definition is the one containing the essential part. In the first variable of the trap, we look for the "Heat alert" string if traps arrive with the main OID but in the first variable they do not contain that text string, the alert would not be triggered. snmp_storm_protection: The max. number of processed SNMP traps by the same source IP in a given interval (see below). snmp_storm_timeout:: The interval in seconds for protection against an SNMP Trap Storm. During this interval, the system will only process 'snmp_storm_protection' type traps from the same source (IP). Trap storm protection combined with traps filtering (see below) allows that if we receive hundreds of thousands of traps per day, we work with only a few thousand traps to eliminate redundant or unhelpful traps. Some systems receive a large number of traps from which only a small percentage is interesting to monitor. With Pandora FMS it is possible to filter the traps that the server receives in order to avoid unnecessary loading of the application. %l: current day of the month. %a: Origin address (traps version 1 only). %v: List of variables separated by tab (custom OID). Since more than one filter can be created simultaneously, the search will take into account those traps that meet all filtering conditions. This view allows you to see statistics of traps, both by origin (IP) and by OID, this allows an effective management of the filters, by identifying the IP's that generate more traps and the OIDs that repeat more. 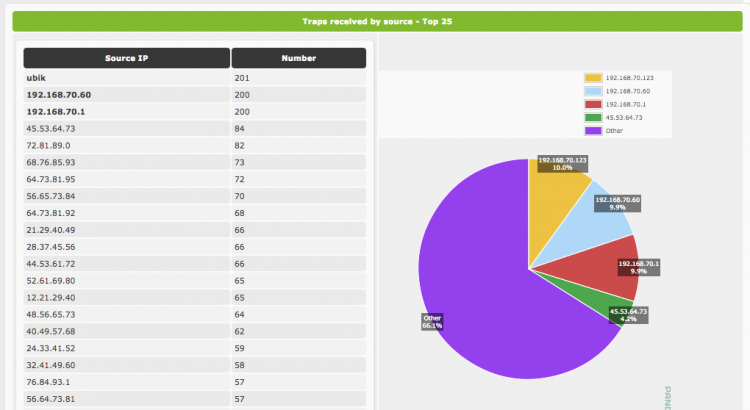 The system displays statistics of traps for the last 30 days. In order to give the operator a better understanding of the traps sent by the monitored devices, it's possible to either load the manufacturer's MIBs into Pandora FMS or to edit the traps to your liking. The functions mentioned so far are all features of the Pandora FMS Enterprise Version. We call the process "edit a trap" where it is allowed to "customize" the appearance of a trap in the console. If you look at the next capture, all your traps may be difficult to distinguish because of the cryptic information they contain. This way, when you find traps with the OID ". 1.3.6.6.1.4.1.2789.2005" you will see them as "Blue box sample". And it'll be easier to tell them apart. Its content (including the original OID) will remain unchanged. "Custom OID" is a Perl compatible regular expression that will be matched against the part of the trap string containing variable bindings. It is generally not needed to translate a trap. "Custom OID" is not meant to be the whole variable binding string, which can be larger than its supported maximum length, but rather a regular expression that matches one or more variables. Keep in mind that all previous traps will not change their appearance, this will start working with the new traps that enter the system from now on. This option is suitable for uploading traps MIBS (exclusively) and expanding Pandora's internal translation database, so that when a trap arrives, it will be automatically translated by its description. To upload the Manufacturer's MIBs click on "Browse", choose the file that should be with txt extension and click on "Upload MIB". Once uploaded, the system is going to incorporate it to its trap library. The previously described alerts are only going to be used where the trap is appropriately defined. It's always the same and it doesn't bear any relevant data to recover. Custom data: 1.3.6.1.4.1.2789.2005.1 = STRING: "ID-00342" .1.3.6.1.4.1.2789.2005.2 = STRING: "Automated check"
.1.3.6.1.4.1.2789.2005.3 = STRING: "NIC Offline" .1.3.6.1.4.1.2789.2005.4 = STRING: "4897584AH/345"
This is a 'complex' trap which contains complex data alongside an OID and a value, based on many other OIDs and values. In its complex part, a trap can contain a completely randomized structure which is based on OIDs or value pairs (e.g. counters, numerical, alphanumerical, dates, etc.). If you carefully read the extended info (Custom data), there might be some pieces of useful data. In the first field, bearing the OID ending of '2005.1' looks like an identifier. The third field, bearing the OID ending of '2005.3' looks like an error message. Fields 2 and 4 don't look pretty useful, since they seem to be of unknown code to us. The challenge is to make an alert which produces a 'match' in those fields, obtaining the piece of data and using it to create a message in the alert later. We're able to perform this task using Pandora FMS and advanced regular expressions and selectors. You can find more info about regular expressions here. The selectors are using brackets (), allowing us to 'copy' information by utilizing a search expression. 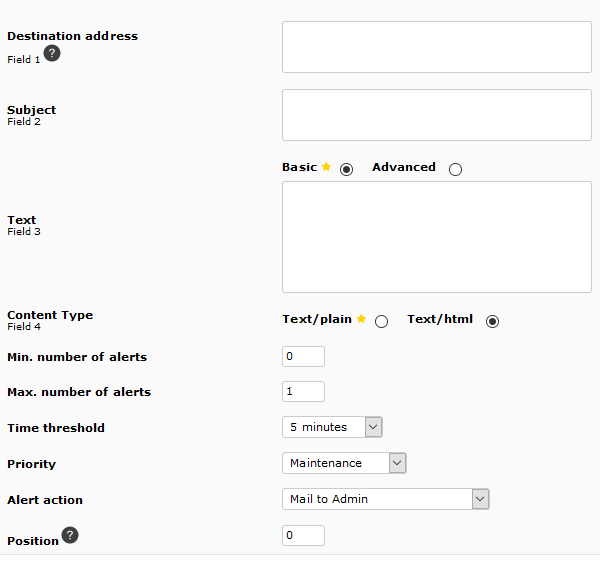 Once we've obtained the data fields, we're required to use them in the alert. For this purpose, the special macros '_snmp_f1_', '_snmp_f2_' and '_snmp_f3_' are used. Using these macros doesn't make any sense outside any SNMP trap alert. The picture below shows how the complete alert is created. This additional example uses an email alert to send information about the interface name each time you receive a specific trap. You're going to produce an email containing a device name, IP and interface name as received in the trap. This is the received mail. This is the trap definition. The alerts defined on traps are completely independent from Pandora's Alert Engine, so correlations of them trigger an alert if the temperature reaches 29 degrees and the trap for secondary power supply is on. This type of alerts cannot be displayed since they're -possibly- not associated to any modules of Pandora FMS. Therefore, the trap console monitoring cannot be related to elements such as reports or maps. In order to achieve this, we've created a method called 'Agent SNMP Trap Forwarding'. This server-wide option forwards the trap to a special agent's module named 'SNMPTrap' as a text string, but only if the trap's originating IP address is defined as the agent's IP. Whenever this occurs, the trap arrives as a text line to the agent within that module, which is one that's only defined on arrival of the first trap. Text alerts can be specified within that module, these being completely standard, just as any other module. This enables a customization of SNMP Monitoring in order for certain traps from certain origins to be treated as yet another type of module, which are thereby integrated into the rest of the monitoring, including Alert Correlation. This is an Enterprise feature which could be activated on the main setup screen as shown below. 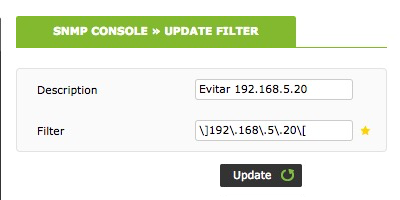 If this setting is changed, the Pandora FMS Server must be restarted to enable it. Another solution is to mount an alert on the trap to activate an agent's module. If the trap has a '1' in a certain log file, there is an agent reading that file, ready to run it when it finds this '1'. In this way, the module is going to be triggered if the desired trap arrives and the correlation can be established, based on the arrived trap. The SNMP console is made for the sole purpose of obtaining traps. It only processes TRAPs as individual items. One trap is able to contain a lot of information. Sometimes, you have a situation when the only monitoring we're able to conduct is based on traps. For doing so, we might choose to post-process the obtained information of one trap by an external script working as a plug in. On the screen shots below, you can see how a special alert is created. It executes a script which contains the complete content of the trap (_data_) and shows how an SNMP type of alert is created. In such a case, it has been mapped for the specific OID (.1.3.6.1.4.1.1722.2.10.1.1.1), although it could have been more general, e.g. (.1.3.6.1.4.1.1722) to call the script when there would be any type of traps like these (.1.3.6.1.4.1.1722, I suppose it would be part of the AIX specific MIB). When designing a script which 'parses' each of these data, e.g. 'miscript.pl' and storing it under '/var/spool/pandora/data_in' in the XML file along with a generic name and one random number, e.g. 'snmp_gateway.31415.data'. The generated XML is supposed to look like the one on the picture below. The application is endless, but any script should be customized and it would have a very dynamic structure. Under a lot of systems, the information which gets received doesn't solely consist of text. It's also numerical and therefore able to feed numerical information to the modules in order to represent e.g. graphics, etc. Note that the data generated in XML should always be asynchronous. One of the most problematic things to monitor is the monitoring of distributed infrastructure. It gets even harder if each version changes its implementation to gather information (like VMware or ESX). In this chapter, we're going to explain how to monitor ESX systems by using an external SNMP Trap Handler. .1.3.6.1.4.1.6876.4.3.301 = STRING: "host"  .1.3.6.1.4.1.6876.4.3.302 = STRING: "c7000-06-01.tsm.inet"      .1.3.6.1.4.1.6876.4.3.303 = ""
cpu usage - Metric Usage = 1%"
.1.3.6.1.4.1.6876.4.3.301 = STRING: "host"  .1.3.6.1.4.1.6876.4.3.302 = STRING: "dl360-00.tsm.inet" .1.3.6.1.4.1.6876.4.3.303 = ""
memory usage - Metric Usage = 84%"
Storage space actually used = 55%"
Please create the handler script. You may base your work on the script which is provided below. Please create an alert command. Please create an alert action using the previous command. You can add some custom options for each 'destination' agent you want (if you possess several farms of ESX, you're probably going to like to host the data on different agents). 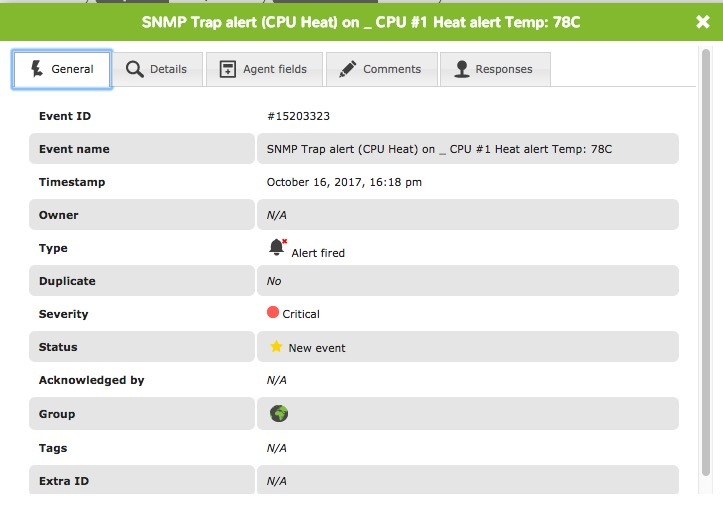 Please create an SNMP trap-alert which maps the enterprise OID (information trap contains for all kind of this specific technology) and / or the source trap IP address. Now we're going to show how to create the trap-handler script. # The first parameter is always the destination host for the virtual server. We're going to create a specific action to send all information to specific trap agents. In this case, all information is going to be sent to an agent named 'WINN1247VSR'. The above mentioned command accepts the name of the agent as a parameter which is going to receive all the information (ESX Virtual Center), and 'chunks off' " the data from the trap, which can be unlimited and also includes all the information you're sending to the trap. You may set alert traps by using the action you've just created. In order to process all the traps the of ESX type by using the specific OID '.1.3.6.1.4.1.6876.4.3.301' to map the ESX type traps. You also have the option of filtering by source IP for each virtual center by filtering for the originating IP address (which is contained in the trap). This is an example of how the information is going to look. You may manage them as standard modules by this data. With Pandora FMS, it's also possible to forward SNMP traps to an external host by enabling the token named snmp_forward_trap within the server configuration file. If you'd like to learn more about it, you can find more info here. 1. The snmpconsole parameter must be active for the pandora fms server. 2. 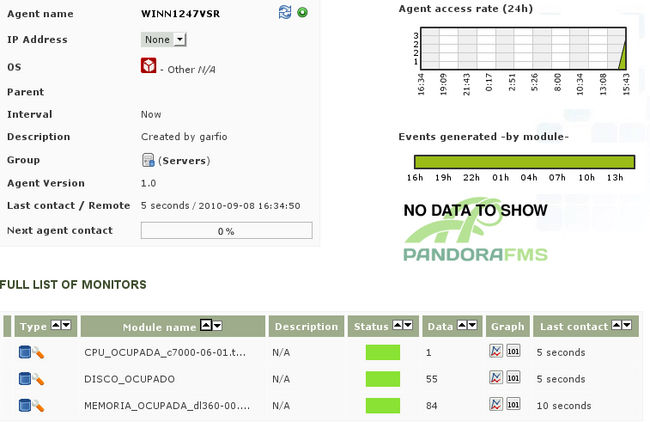 The logs configured in the pandora fms server must be the same as the ones in the independent call to snmptrapd. Stop the Pandora FMS server. Start snmptrapd manually (with the format indicated above). Start the Pandora FMS Server. The snmptrapd process can be stopped and started without having to stop or start the pandora server process if the pandora_snmptrap.log.index and pandora_snmptrap.log haven't been modified. If those files are modified it is necessary to restart the pandora server. If you need to rotate externally the traps log files then you should restart the pandora server, after deleting the two files previously mentioned. 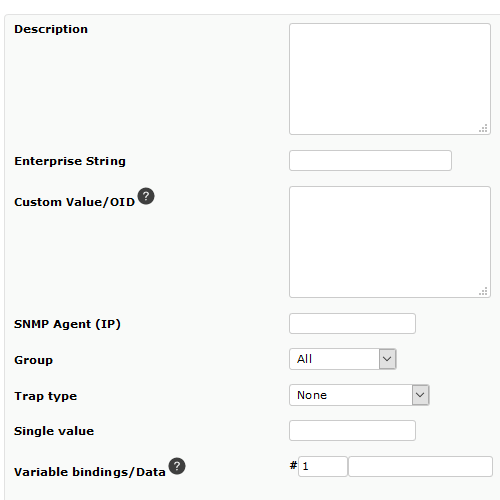 If SNMP traps are sent to an external manager through an unreliable connection some information will be lost. Pandora FMS allows you to instead forward traps from a local snmptrapd to your Pandora FMS Server in a reliable way. An SNMP agent sends traps to a local snmptrapd. A local Pandora FMS agent reads traps from snmptrapd's log file and sends them to the designated Pandora FMS Server inside an XML data file, saving it to the XML buffer and retrying at a later time if necessary. The Data Server reads traps from XML data files and dumps them to a plain text file. The SNMP Console processes traps from the plain text file. Having the SNMP Console directly process traps from snmptrapd's log file is more efficient. This setup should only be used if direct connectivity or reliability are a concern. A local snmptrapd that is receiving traps. A local Pandora FMS Agent. We will use the grep_snmptrapd plugin that comes with the Pandora FMS agent to read data from snmptrapd's log file. We need to tell the SNMP Console to process traps from an external log file that will be written by the Data Server. snmp_extlog can be any file writable by the Pandora FMS Server, but it must be different from snmp_logfile (defined in /etc/pandora/pandora_agent.conf too). 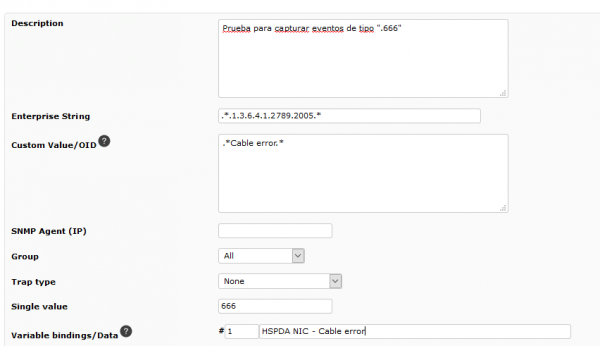 With this tool you can generate custom traps that we can later see in the SNMP console. Host Address: This is the destination IP to which we are going to send the trap. Community: Where we will set the password of the SNMP community we are trying to access with the trap generator. Value: The value that we want to give the trap and that will then appear as Data. SNMP Agent: We have to insert the agent where we are going to simulate the trap, putting obligatorily the IP of the same one. Cold Start: Indicates that the agent has been started or restarted. Warm Start: Indicates that the agent configuration has been modified. Link down: Indicates that the communication interface is out of service (inactive). Link up: Indicates that a communication interface has been activated. 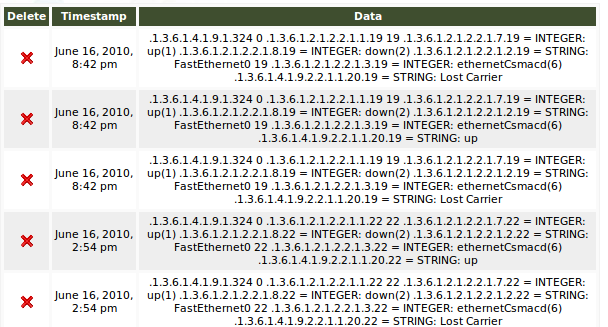 EGP neighbor loss: Indicates that on systems where routers using the EGP protocol, a nearby host is out of service. Enterprise: In this category you will find all the new traps. Including traps from suppliers.